Police are looking for three suspects after a Moksha Yoga Studio in Stoney Creek was burglarized on Canada Day. Police are looking for three suspects after a Moksha Yoga Studio in Stoney Creek was robbed on Canada Day, and almost $20,000 in Lululemon gear was stolen. 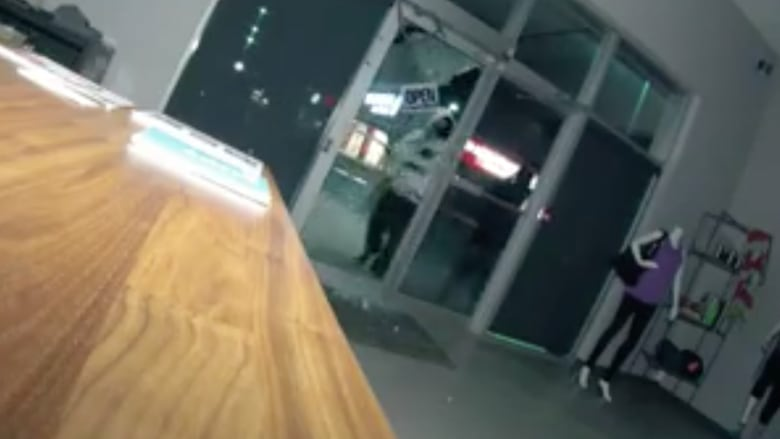 Detectives say that just before 11:30 p.m. on July 1, three masked men broke into the studio located at 270 Mud St. W, by using a hammer to smash in the glass door of the front entrance. Once the men are inside, they can be seen frantically grabbing Lululemon clothes. Police say they stole about $20,000 worth of clothing, and it's believed they used a stolen vehicle to get away. "There have been previous property crimes reported at this location and other Moksha Yoga locations," police said in a news release. "Detectives are considering the possibility that the same suspects may in fact be involved in these crimes." Anyone with information is asked to call police at 905-546-8936, or Crime Stoppers.